These walnuts get tossed in a sweet and spicy glaze and are then perfectly roasted until golden brown. 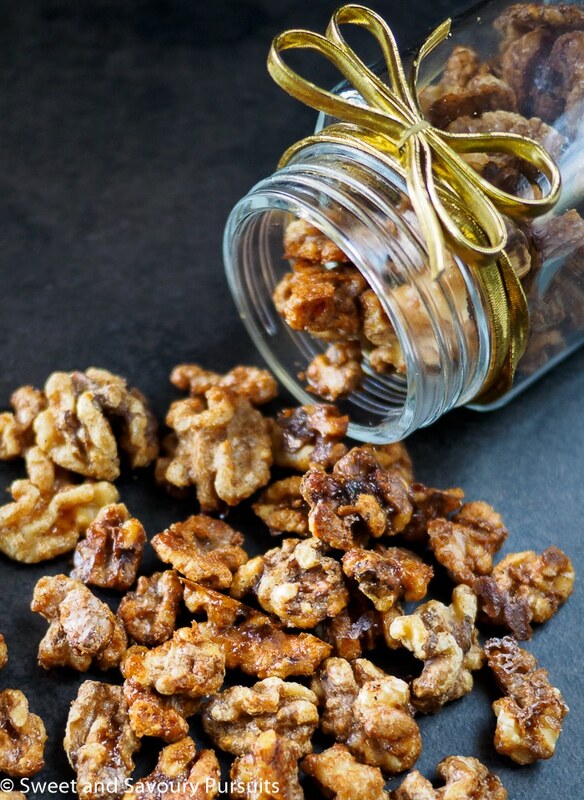 So easy and quick to make, these Maple Spiced Walnuts make a delicious treat and are sure to be a favourite! 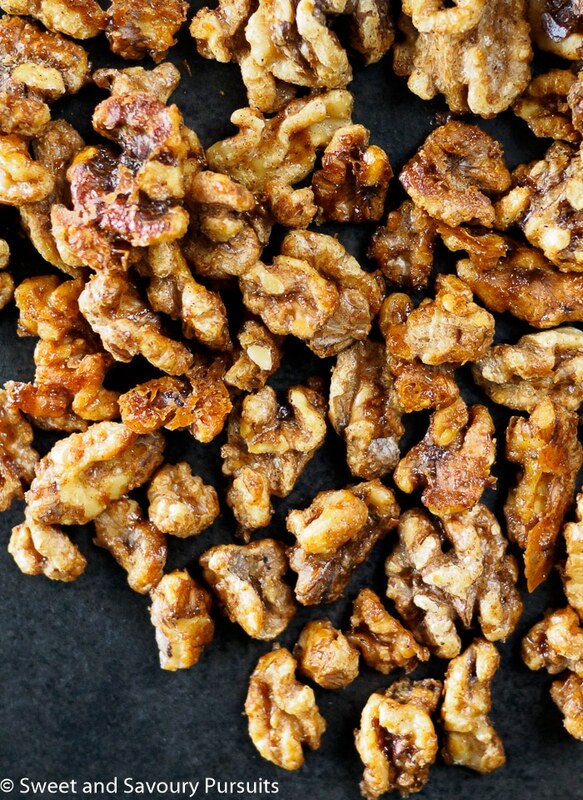 I should start off by warning you that these maple glazed walnuts are addictive. I’m snacking on them as I’m writing this post, and though I was only going to have a few, I can’t stop eating them. They are absolutely delectable! The nuts are crunchy and slightly sweet with a spicy aftertaste. They definitely make a great gluten-free fall snack food and are perfect for serving at game nights and sophisticated enough for cocktail evenings. They’re delicious as a salad topping, and would also make excellent holiday host or hostess gifts. 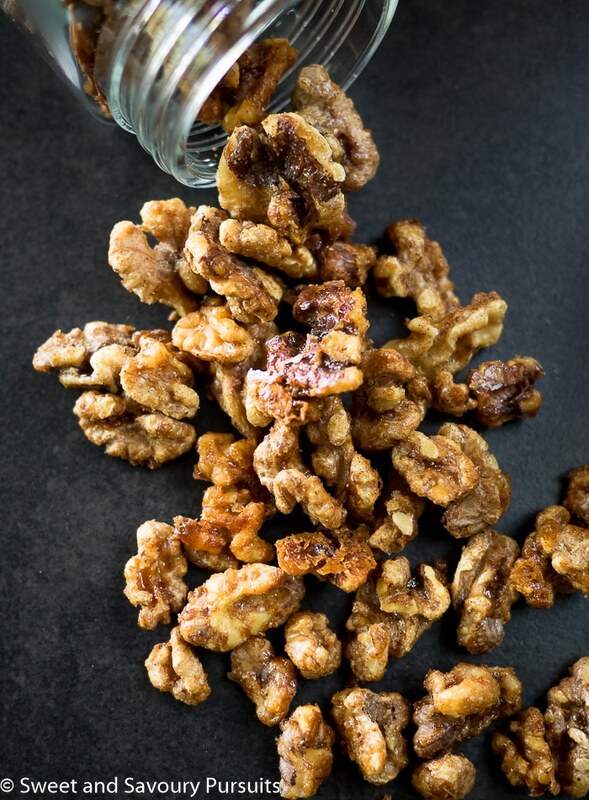 These Maple Spiced Walnuts are incredibly easy to make and only take a few minutes of preparation time. Instead of using sugar, these walnuts are lightly coated with pure maple syrup and a combination of warm spices. The maple and spice combination in this recipe can be used to flavour raw pecans, almonds or cashews or a combination of these nuts. The mixture of cinnamon, ginger and nutmeg make these perfect for fall and the holiday season. As the spiced walnuts are roasting in the oven, a delicious aroma will fill your house and make your home smell amazing and so inviting! These spiced maple glazed walnuts are so good and so versatile that you may want to double the recipe to ensure you have enough to go around. Enjoy! With a rack in the middle of your oven, preheat the oven to 325°F. Prepare a baking sheet by lining it with parchment paper. In a medium bowl, combine the maple syrup, oil, cinnamon, ginger, nutmeg, salt and cayenne. Whisk together and add the walnuts, toss to coat walnuts well with the syrupy spice mixture. Spread walnuts onto the baking sheet in one even single layer. Bake in oven for 10 min, then stir and bake for approximately 10 minutes more until walnuts are golden brown. Remove from the oven and let cool completely on sheet. *Consider increasing the cayenne to 1/4 teaspoon or more if you like things extra spicy! I think to make this recipe is very hard but you have made it in a easy way. I’m glad you think so. Thank you! Yum! These walnuts sound so good! What a great snack for fall! Thanks Nancy, I’ve already made a few batches and planning on more! I love spiced nuts, can’t wait to give these a try. Thank you, hope you enjoy them! These sure look good, Fida. They would make a great Christmas gift. And I love your pictures! Thank so much Louise, I loved them so much I’m planning on making some to give away as gifts. Thank you, the fact that they’re sweet and spicy makes them so addictive!